The Laurel Municipal Pool Complex is a 92,000 square foot swimming complex. The complex was built in 1953. The Laurel Swimming Pool Site was once a cotton mill employing more than 700 people. The Pool features a main pool, lap pool, baby pool, a diving well, snack bar, office and meeting room. The meeting room is available to rent for meetings or parties. If you are seeking information on Pool admissions, Swimming Lessons or other aquatic programs check out our program guide. The 2019 Pool Camp Application can be found below. This is an application only and does not guarantee any use. Only one application per camp will be accepted. 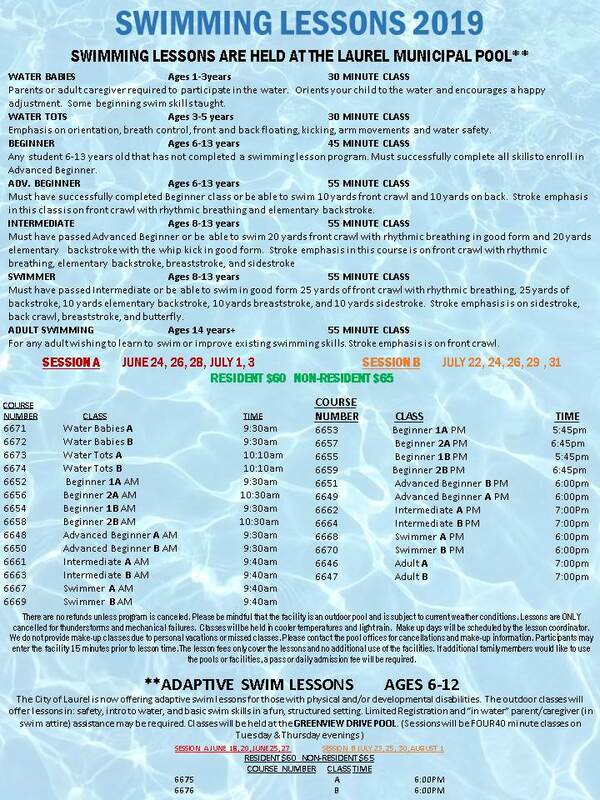 If approved, your camp will be assigned a designated time at one of our two pools. Being flexible (circling as many days and times as possible) will increase your chances of being granted pool time. Non Resident Camps will be charged a daily fee of $5.00 for each person entering the facility. Resident camps will be charged $3.50 for each person entering the facility. All camp fees are to be paid in full in one transaction at the site prior to entry. No invoicing. Showing up without an approved application or bringing more campers than you have listed on your application will result in being denied entry to the pool. A signed copy of the Rules and Regulations is required with any approved application prior to admission. Deadline for all camp pool use applications are due by April 5th, 2019.